As governors from across the country convene at the National Governor's Association Summer Meeting this week in Sante Fe, New Mexico, we took a look at the most vocal governors on issues facing states in 2018. For each issue, you'll find the top-10 most vocal governors, a spotlight on the most vocal governor, and trends in dialogue such as the most common hashtag used when discussing the issue on Twitter. 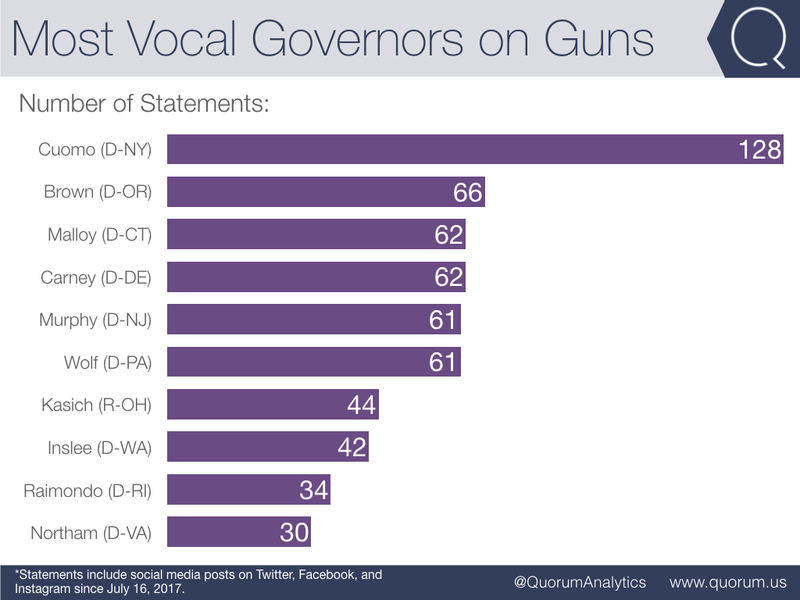 Here's a snapshot at the most vocal governors on guns, and download the full report for a look at 10 other issue areas. New York Governor Andrew Cuomo is the most vocal governor on guns, making 128 statements over the past 12 months. Cuomo has made almost twice as many statements as the second most vocal governor, Oregon's Kate Brown. Ohio Governor John Kasich is the only Republican to make the top-10. Cumulatively, governors gave 437 statements in the past 12 months on guns. In 2018, Cuomo took a number of actions to address gun reform in New York, including advocating for legislation and meeting with advocacy groups. Like the rest of the group of governors, Cuomo's dialogue peaked in February following the shooting at Marjory Stoneman Douglas High School, with 53 of his 128 statements coming in February. He has continued to be more vocal since, making more statements per month on guns in 2018 than he did in 2017. 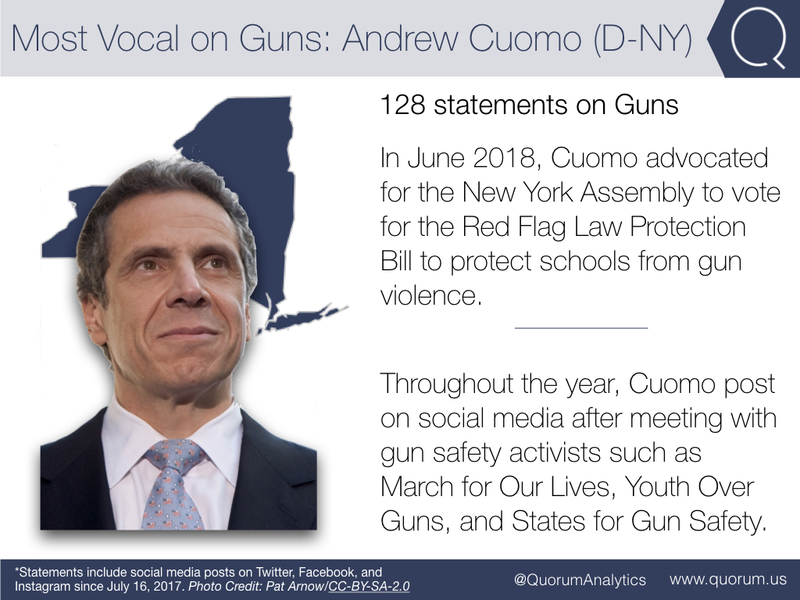 Most recently, Cuomo applauded the New York Assembly for passing the Red Flag Gun Protection Bill, while imploring the State Senate to vote in favor of passage. Dialogue amongst all governors on guns peaked in March, just after the shooting at Marjory Stoneman Douglas High School, with 205 mentions. While dialogue peaked in February and March, volume has continued to outdo that of 2017. In the months measured in the report in 2017, October was the most vocal month with 42 statements form governors, while each month since February 2018 has outpaced that number. 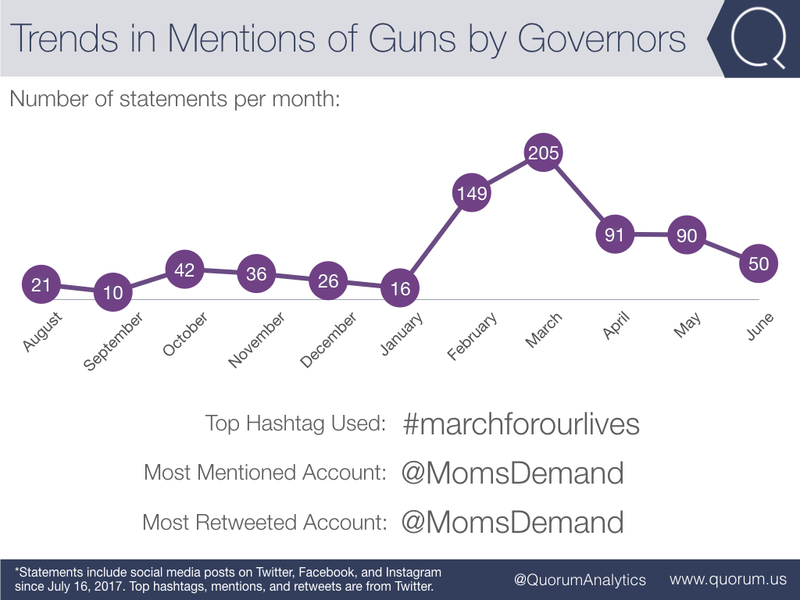 The hashtag #marchforourlives was used 35 times by governors over the past year, while @MomsDemand was retweeted or mentioned nearly 20 times. Download our full report to see the most vocal governors on jobs, education, President Trump, and more.